Down its leading offensive player for the final five minutes of a tight contest, the No. 21 Cal women’s basketball team (14-5, 5-3) escaped southern California with a split of their UCLA-USC weekend series by defeating the Trojans (13-6, 3-5) 62-59. “Survive and advance” has been the go-to strategy that the Bears have deployed over recent weeks. Though Cal has yet to fall to an unranked opponent all season long, it has had several close calls to teams near the bottom half of the Pac-12 standings. 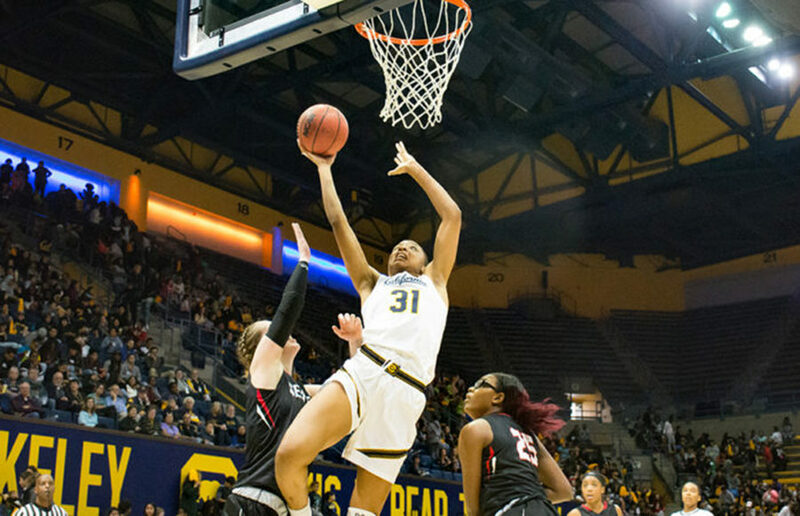 When junior forward Kristine Anigwe — who collected a team-leading 20 points — picked up her fifth foul at the 5:01 mark of the fourth quarter, the big question for the Bears became, who would step up offensively. But for nearly five minutes down the stretch of the game, nobody rose to the occasion and Cal went cold from the field as USC turned up its defensive pressure. Fortunately for the Bears, the Trojans’ offense was coming up equally empty in the second half as well. With chances to tie the game or take the lead, junior guard Aliyah Mazyck — USC’s leading 3-point threat — misfired on four threes in the final 1:16 of the game. While all five of USC’s starters played at least 36 minutes — with Mazyck, and seniors Kristen Simon and Mariya Moore playing all 40 — the Bears relied on sophomore guard Jaelyn Brown and sophomore center CJ West for 20 minutes of playing time each. Consistent production on both ends of the court wasn’t common for Cal throughout the game. But senior guard Mikayla Cowling was the rare exception, producing a much-needed, all-around solid performance, keeping Mazyck and senior guard Sadie Edwards in check while collecting 12 points of her own. If the Bears have followed a certain sports phenomenon in its past few wins, it’s that sometimes it’s better to be clutch than consistent all game, like banking in a game-winning three after piling up bricks all game. 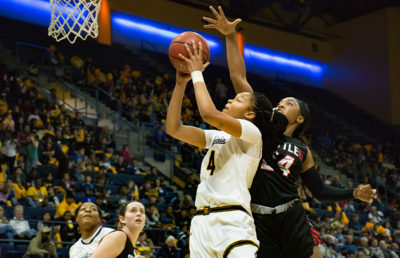 While Cal’s escape wasn’t nearly as dramatic, it was junior guard Asha Thomas who had the clutch factor down the stretch. Thomas’ back-to-back layups inside of 2:30 to go were the first Bear field goals since Cowling’s jumper at the 8:49 mark. The junior’s pair of buckets gave Cal the lead on both occasions, a lead that stood after the Trojans missed three consecutive treys in the final 18 seconds. Stepping out beyond the painted area has benefited the Bears of late; Cal’s 46.7 percent conversion rate from downtown bested USC’s 22.2 percent. 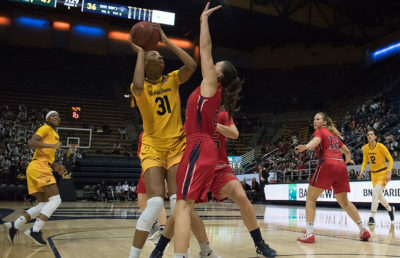 In addition, the rebounding prowess of West and senior forward Penina Davidson helped Cal maintain its late advantage by each collecting 10 boards. West’s second double-digit rebounding effort on the year matched a career high, and the timing couldn’t have been better with Anigwe’s limited court time. The Bears battled with USC’s athletic starting five throughout the first half, jumping out to a 10-2 early lead before Simon began turning things around early on for the Trojans. 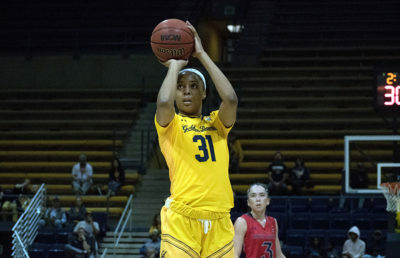 Despite the loss, Simon’s 21 points on 7 of 14 shooting undoubtedly assisted her ongoing case for Pac-12 Player of the Year — a prize that both she and Anigwe are prime candidates for. While USC is far from an inferior team, the story unfolded as it has all season as Cal faced another wire-to-wire contest against an unranked squad, only to come out on top once again. With No. 22 Arizona State, No. 7 Oregon and No. 18 Oregon State on the schedule over the next couple of weeks, the Bears will need to dial up their offensive rhythm to keep up in the competitive Pac-12.